Back in March, Mojang announced the next update for Minecraft, announcing that it would be available for the Windows 10 version of Minecraft and also for mobile versions. It is known as update 1.1, or “The Discovery Update”, because its focus is on discovering things. There was a lot of mystery behind the update, with the developers stating that they will be “revealing even more of the Discovery Update’s secrets in the coming weeks”. But, thankfully, the wait is now over. What is part of The Discovery Update? First things first, there’s the spooky Woodlands Mansions. Without giving away any spoilers, Mojang have asked players to find out what treasures, or perils, lie within the creepy mansions. 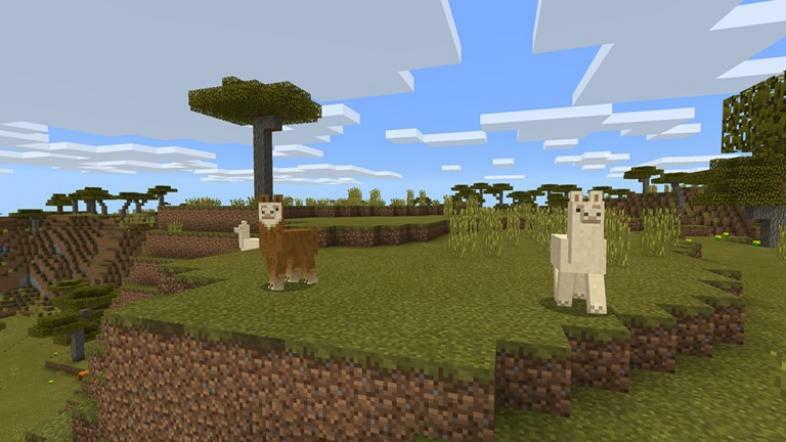 Further to that, as you can see in the picture, players can now come across llamas, new blocks – such as concrete – and also new enchantments. One of these new enchantments is entitled “Frostwalking”, and it allows players to walk across water. So you no longer have to get irritated when you are out exploring and come across water that you can’t get across – at last! The other enchantment is called “Mending”, which keeps your sword sharp. Useful for when you’re hunting around at night! In addition to the above, there are various smaller updates, such as maps being numbered (so it is easier to tell which map is which), 9 strings being produced from 1 cobweb and even the eating animation can now be seen in the third-person camera! So along the big things, there is also a few smaller things here and there to add to the huge update. Whilst all the bigger and smaller bits and pieces of the updates mentioned above are pretty exciting, there is one big thing that stands out in the huge list of additions to the game, and that is the Minecraft Marketplace. At the Minecraft Marketplace, players are able to buy, download and play creations made by the community from within the game itself. This includes maps, skins and texture packs. The Minecraft developers have described the Marketplace as offering “an endless stream of community creations to change the way you play”. I’ve had a look at some of the creations on there myself, and some of them are pretty epic! In fact, you can watch a neat little video telling you about the Minecraft Marketplace on the official Minecraft website (. So it’s time to fall in love with Minecraft all over again (that is unless you never fell out of love with it) and enjoy even more additions to this fantastic game.